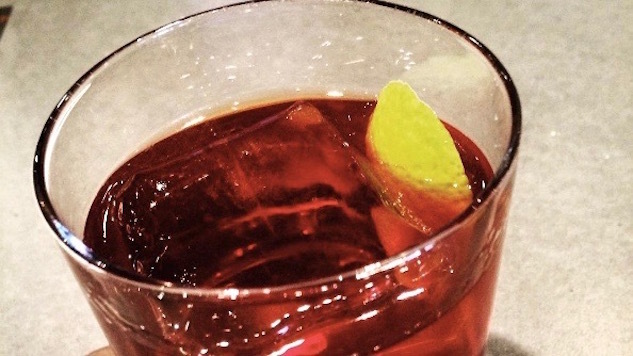 Part Sazerac, part Manhattan and all New Orleans — the Vieux Carré is a boozy classic that could only be born in a town like the Big Easy where a stiff drink is de rigeur. All sprits and no filler, the cocktail combines rye, cognac, vermouth, Bénédictine, and bitters to produce something every bit as magical and mysterious as its place of birth. Created in 1938 by bartender Walter Bergeron at the Hotel Monteleone’s famous rotating Carousel Bar, the name (pronounced “voo-car-ay”) comes from the French for “old square,” the term for New Orleans’ French Quarter. The Carousel Bar: one of the few places where the bartender won’t cut you off when you say the room is spinning. According to Kent Westmoreland, mixologist at The Cocktail Bar in New Orleans, “the ingredients represent the nationalities of the original French Quarter residents.” You have rye for the Americans, Bénédictine and cognac for the French, sweet vermouth for the Italians, and bitters for the Caribbean people. The result is a balanced, complex, and potent cocktail that is dangerously easy to drink. Directions: Combine ingredients in a tumbler over ice, and stir. Garnish with an orange twist. Directions: Combine ingredients in a mixing glass with ice and stir until chilled. Syrian into a chilled coupe or cocktail glass. Garnish with a brandied cherry.